In 1912, the same year the Titanic sank, a young teacher began offering courses in human relations and communications at the YMCA in New York City. His approach was to teach and demonstrate everyday skills rather than formal speech tips that did not translate into the real world of communication. Over time, Dale Carnegie revised and improved his curriculum. A significant part of his content can be found in How to Win Friends and Influence People. This is an essential book to read and reread many times. The book is comprised of 30 principles organized into four sections: Fundamental techniques for handling people, Six ways to make people like you, How to win people to your way of thinking, and Changing people effectively as a leader. 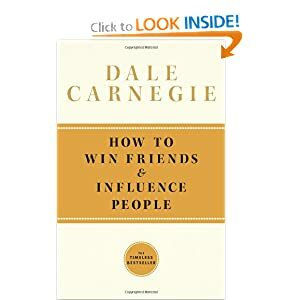 Each principle is illustrated with numerous stories, either experienced personally by Dale Carnegie or based on his extensive study of historical figures. Though some stories are dated, the principles are timeless and will improve how you communicate with others. You can download a free copy of Dale Carnegie's Secrets of Success booklet from DaleCarnegie.com. This small booklet contains the principles from How to Win Friends and Influence People and How to Stop Worrying and Start Living. A free iPhone app is also available at the iTunes store.